I’m down with a cold, but will do my best to rally to go out with the husband and daughter tonight for trick-or-treating. In the meantime, a little Halloween goodness that blaueteufelin posted. Take it away, Anthony Stewart Head! There’s an item that’s been on my wish list for a long time. I needed a pick-me-up a couple of weeks ago, so I ordered it. It arrived last week. Behold! 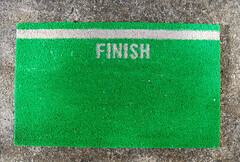 The finish line doormat! When I put it on my wish list, I thought it would be great after a run. Now I think it’s just great because it is a reminder that yes, I am done with the many many tasks of the day and I am home. I have made it through another day. I win! I wasn’t home when it arrived, so my husband dropped me a line asking what this giant box was on the doorstep and whether our daughter could open it. I told him what it was, and they opened it. He wasn’t kidding about it being an enormous box. Seriously, Amazon? 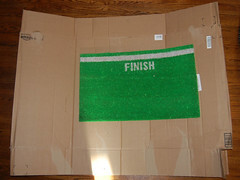 You had to kill an entire tree to ship me a doormat? With a box that big, it’s easy to see why Em was so eager to open it. Still, Mr. Tvini says that she looked disappointed after it was open. Dad: But Mom told us what it was – a doormat. Em: Yes, I know. I just thought it might be something cool. Sorry, kid. At least the cat enjoyed it. It’s way past time to go to bed. There’s another race to be run tomorrow, and that finish line is still a long way off. Night!